It had been a while since Michele and I attended a movie at the theater. It is not only expensive–about fifty bucks for two tickets a couple popcorns and sodas, but the theater is almost an hour away from our house up here in Alaska. 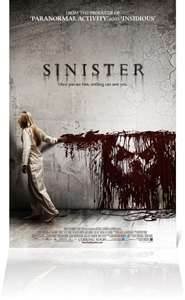 Sinister (2012) was a scary film. It is sort of like Paranormal Activity but not quite. It is about a true crime writer the movies into the scene of a grizzly crime in order to write his next best seller. Then he finds a box of home movies in the attic and the rest, as they say, are history. This is a movie that will catch you by the throat and hold on if you are not careful. While Michele didn’t like it (I think she was scared..) I did and I would recommend it to anyone that likes a good scary thriller. It scared the hell out of me! Children shouldn’t be killers! Talk about freaky!